Whether it is stuffed with shrimp and tomatoes or in the form of breaded and fried rings, squid is delicious. So isn’t it annoying that you, as a prolific angler, can only get it from the market? 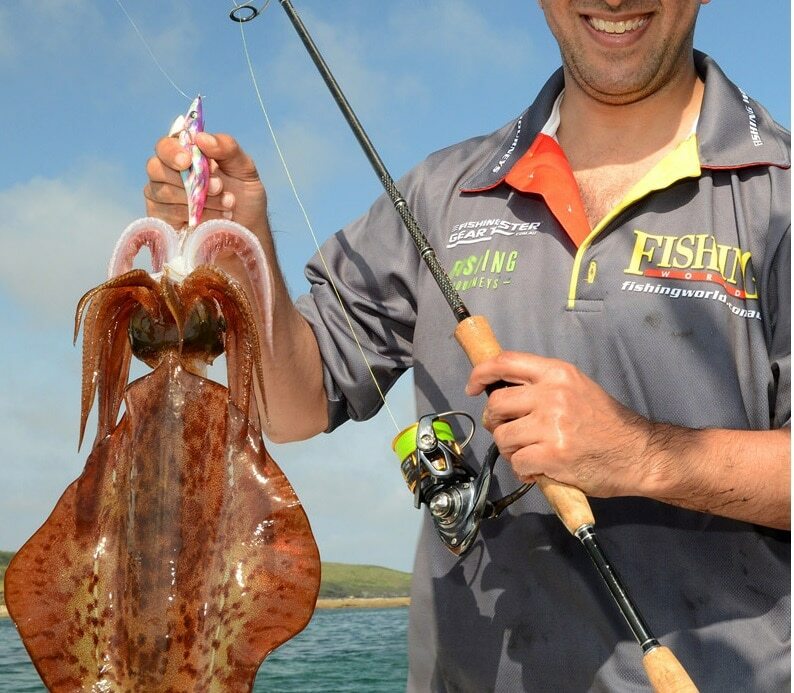 You know very well that the best tasting fish is the one you catch yourself, so shouldn’t that apply to squid? But how to catch squid? Luckily, fishing for squid, or squiding, as some people call it, by which I basically mean just myself, I call it that, has become quite popular in the last few years. And we took it upon ourselves to use the experience of other fishing enthusiasts to give you a comprehensive how-and-where about what you need to know. While squid and octopi have conquered all the salt waters of the World, the type of squid that you will be going for prefers warmer and shallow waters. Now, warmer doesn’t necessarily mean the Gulf of Mexico, you can go as far up north as southern England, but if you plan on catching squid off the shores of Alaska you are probably in for a long wait, at least until global warming works its magic. Squid live in shallow waters, not far from the shore. They usually dwell close to the bottom of the sea, where they hunt and do other squidgy things. 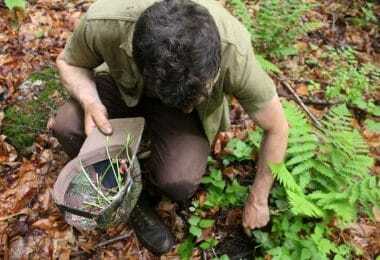 Their hunting methods are important to know because based on their behavior you can choose the ideal spots for catching them. To protect themselves from predators, squid spends as much time as possible hidden among seaweed, corals or rocks. From there they carry out sneak attacks on small fish or shrimp. For this, they will dart out from hiding and retreat instantly. This is the moment you want to catch them in. Therefore, chose a place which isn’t too deep, where your lure can reach the bottom and where squid has ample hiding places. Ideally, go where a carpet of seaweed meets a larger patch of sand, as your prey will be stalking its own prey at the edge of the seaweed. This means that, while you have better chances of going out with a boat, you can fish for squid directly from the shore, as many fishermen successfully do. Some people might say that a true fisherman will catch anything with just a stick and some yarn, but such people really don’t know a lot about fishing, and you and I know very well that there are specialized tools for a lot of different types of sea-dwellers, and squid are no exception. Just in case you are very new to this, the jig is a type of fishing lure composed of a lead sinker, a hook and a soft, colorful body designed to attract fish. What differentiates jigs from other lures is that they operate by moving vertically through water and are not stationary or move horizontally. Up until a few years back, squid fishing wasn’t really a thing amongst amateur fishing enthusiasts, even today you might stumble upon people who will look at you funny when you mention it. That all changed mainly because of the special squid jig, which has a couple of features without which you would not get far. The first thing you will notice about the squid jig are the hooks, of which you don’t have one or three as you do on regular jigs, but one or two whole rows of them. Even calling them hooks is a bit much, as they are just upward aiming pointers, which aren’t even barbed. The reason for this is that squids don’t approach their prey, and in this case, your lure, as fish do. They don’t just swallow it or bite at it, but first, grab it with their very agile tentacles. 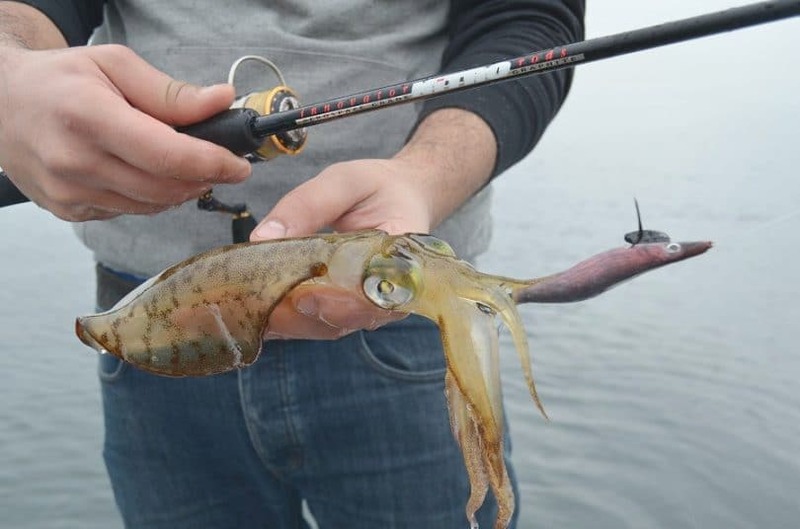 It is very likely that if you have ever been fishing in squid-friendly waters, you have had your lure attacked by a squid, but because you used regular hooks, the tentacle just worked around it, or, if the hook did get in, it simply ripped out, as squid flesh is quite soft. That is why you need so many pointers, to make sure a few of them get in and you don’t put too much pressure on any single one. The design of the body is another important aspect of this type of jig. Squids, like other cephalopods, are pretty intelligent creatures with very good eyesight, as indicated by their huge eyes. So, you will need a jig which can fool a squid. Some of the cheaper ones are pretty simple, bullet shaped and have one color, but for not much of a price difference, you can get some which look convincingly like prawn or small fish. 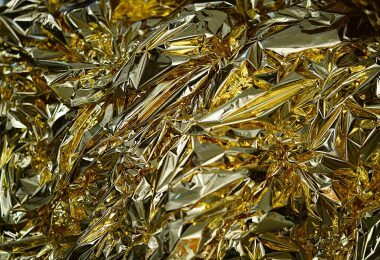 These will also have small bits of metal or other shiny material embedded in them, as these will reflect the light coming from above, which is another thing squids can’t resist. 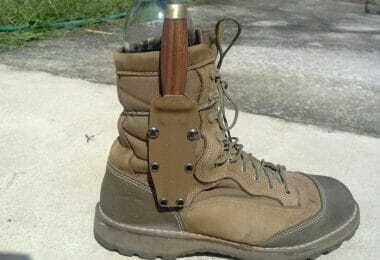 You should actually get a few of these, different sizes, different colors, different weights, as some will work better than others in different situations. Unfortunately, nobody can give you a guide on what size and color you should use under which conditions, as squid psychology studies are not that advanced yet, but, once you are out there, just give them a try until you find one that works best on that particular day in that particular spot. Now, while the specialized squid jig is essential to the whole process, specialized squid rods are not. The important part is that you get a rod which is light and long, as you need one which telegraphs even small changes. A light bass rod or spinning rod will be fine. However, this does not mean that there aren’t special squid rods, should this become more than just an occasional outing for you. These are made from graphite and weigh between 3.8 oz and 4.9 oz, measuring between 7.5’ and 9’. Keep in mind that these are also rather fragile, so you need to be careful with the strain you put on them. Besides the rod, you would also do well with a drop net for taking the squid out of the water. This does not need to be either big or very resistant. The very first thing you need to do to ensure a good catch is to do some research on the squid population in the spot on this Planet where you will be doing the catching. Different species of squid inhabit different parts of the World, some have seasons when they are easier to find or bigger in size, other are there all year long. As mentioned, squid fishing is a relatively new branch of fishing, so your local fishing buddies or fishing club might not have any information that will help you, though you should at least ask. In the worst case scenario, pull up a Wikipedia article about what kinds of squid inhabit your fishing waters and what their behavior is. The basic method for catching squid is called egging. It will take some practice until you get it right, but once you do, you will find that it is a fun exercise and it is very effective. What you do is cast out your jig and let it sink until it is close to the bottom. It might take you a couple of tries until you figure out where the bottom is. This is an instance where a specialized squid rod might come in handy, as these can be sensitive enough to even let you know when you have reached seaweed. Once the jig has reached the desired depth you make two consecutive upward jerking motions with your rod, one after the other. Almost like twitches. Then you let the jig drop a bit. This will mimic the swimming motions of prawns and it should catch the attention of any squid which is nearby. The last part, where you let the jig drop is as important as the upward motions, as this is the moment in nature when the squid pounces on its prey. After you let it drop, you reel the jig in a bit to see if you caught anything. If you haven’t, repeat. Move the jig a bit further. After a while, you can try a different jig. If you have snagged something it is important that you pull constantly so that you keep the pressure on the points of the hook, otherwise the squid can slip off. Remember that there are no barbs on the points. Still, don’t jerk it, and don’t pull it in too quickly as even so you might risk ripping off the hooked tentacle straight of the squid. This is also why the drop net comes in handy so that there is not too much weight on the points once the body is out of the water. Another use for the net is for avoiding getting inked. Remember that squids, just like octopi have ink sacks for avoiding predators. Once you have caught the animal in the net, jerk it in and out of the water a few times, put some stress on it and you will see the ink getting ejected. They have enough ink for several squirts, so do this until no more ink comes out. Should you still get inked, however, don’t worry, it should wash out without a problem as long as don’t let it dry. One more little danger you should watch out for when pulling the squid out of the water is the parrot-like beak. It won’t tear your finger off, but it would not be a nice feeling anyway, so don’t stick your finger in the spot where the ten tentacles converge. An alternate method you can use in very shallow waters close to shore is using a float to keep the jig at a certain level above sea ground. The motion of the water on the surface should be enough to attract some of the squid daring enough to come so close to shore. If you plan on eating the squid then it would be best to kill it as soon as you caught it, since stressing the creature needlessly is not only not very nice but will also affect the flavor negatively. To kill it as quickly and painlessly as possible, just hold the squid by the neck with the top side facing up. Between the hood and the head, there is a gap if you pinch along that gap you should feel a sort of tendon. Just pinch through that. The squid should die instantly. You will know you have done it right if the squid loses color in its hood and turns white. Cleaning it is relatively easy if you have a knife and a chopping board. First, cut off the tentacles just under the eyes. The put your finger just inside the hood-tube and go once round, separating the hood from the rest. 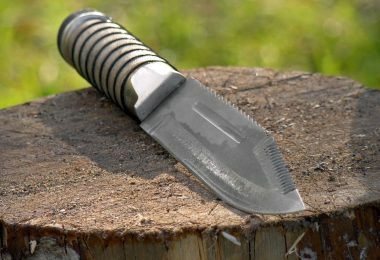 See our list of the best bushcraft knife that you can use in just about anything! The head with the innards should come right off and can be discarded. To skin the hood just rip the skin along the vertical axis with your fingernail and the rest will come off easily. 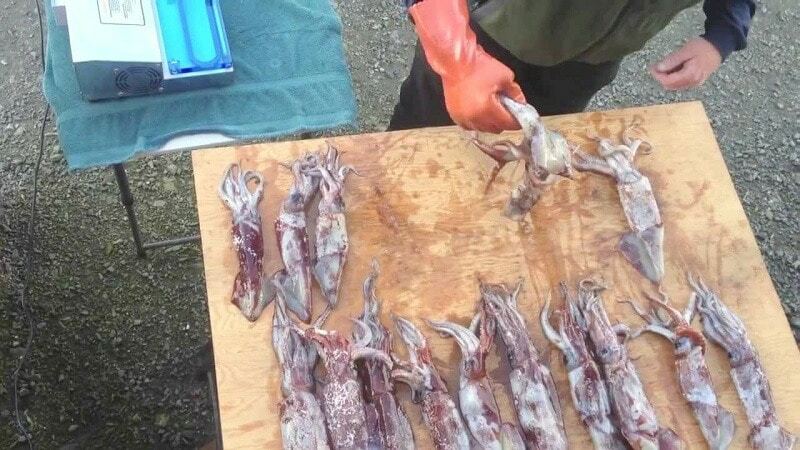 You use the same method if you want to use the squid as bait, though there is a debate whether or not it is better to leave the skin on or off in such situations. 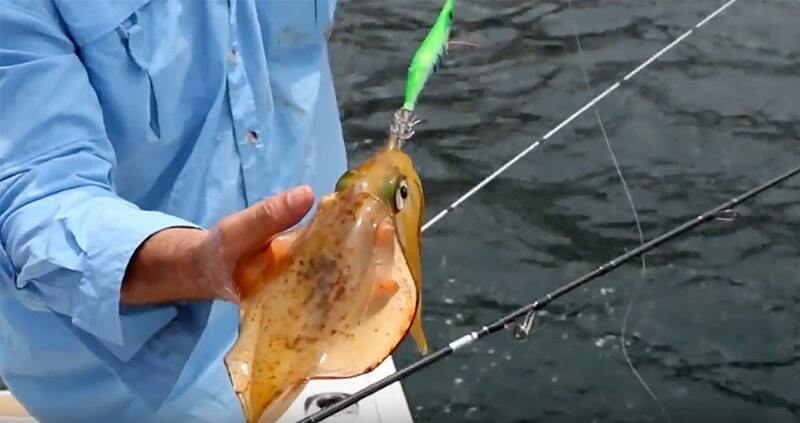 You can also use the squid as live bait if you want to catch something bigger. 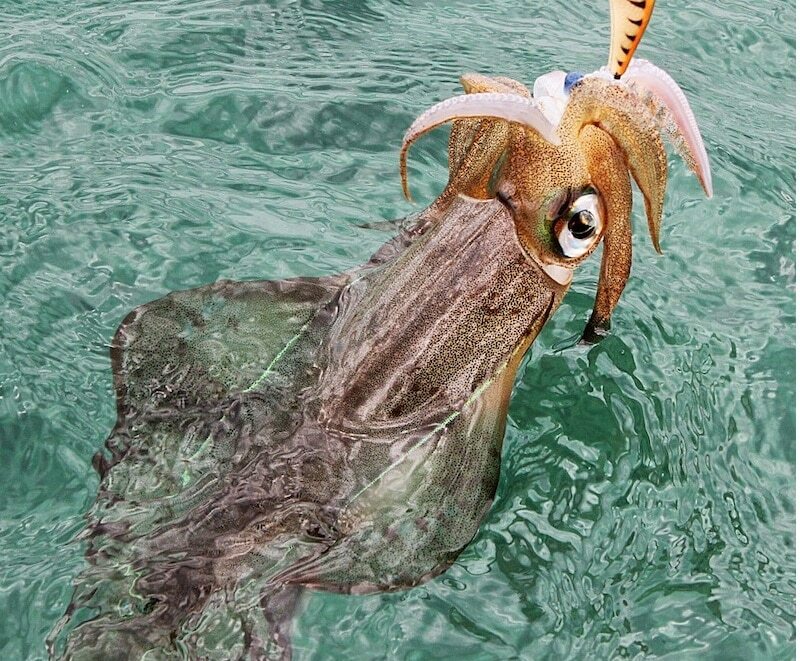 Most fish will go for squid, so it makes great bait for sea fishing. Whether you do it for bait or for a great dinner, squirting is something any fishing enthusiast should try at least once, as it varies from your usual fishing experience and makes for at least a good story. 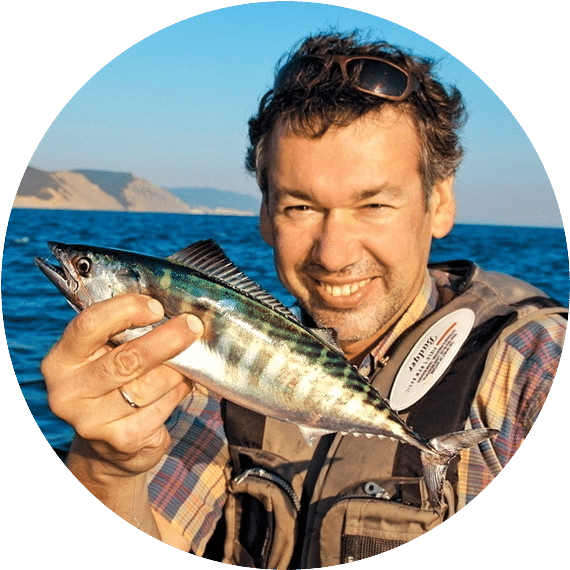 And if you end up really enjoying it, you will be part of a steadily growing community of anglers, which means that there are more and more places you can get hold of the specialized equipment. So just get yourself a couple of jigs, get out there and practice your egging. And if you have any tips to share or stories to tell, let us know. For the ultimate guide on how to fish, check out our must-read article on this crucial topic.